Flood Fight Back: BASKETBALL: Coach Larry Daniels preparing his players for the Flood Fight Back game. WHAT started off as an event to raise money for the sport of basketball after the floods devastated the courts, has turned into a popular fundraising event. The third Flood Fightback games will be played tomorrow night and will have even more significance because it falls on Anzac Day. The games act as a reunion of sorts with former Bears and Bulls players hitting the court against the current crop of players. Bundaberg Basketball operations manager Kerri Savidge said last year part of the money raised went to Live to Give - a self-funded not-for-profit organisation that organises community projects to support disadvantaged and under-privileged children in the community. This year, 50% of the proceeds will go to the RSL Appeal. "Because the game fell on Anzac Day we decided to raise money for the RSL Appeal," Savidge said. "We got permission from the RSL to run a sporting event. "All the athletes will be attending the Bargara Dawn Service." Savidge said former Bulls player Nello Giordana was the creative force behind Flood Fightback. "After the first floods, he was living in Emerald and said he wanted to help out in some way," he said. "He wanted to organise a game where all the money raised would go back to basketball. "It was unreal and guys that played for the club in the 80s and 90s came back to play and turned it into a reunion." Savidge said with a high number of Americans playing in Bundaberg, it was important for them to understand the significance of the event for the nation. "The former players designed the uniforms themselves," she said. "For the men's it was fatigues and for the women, it was poppies." 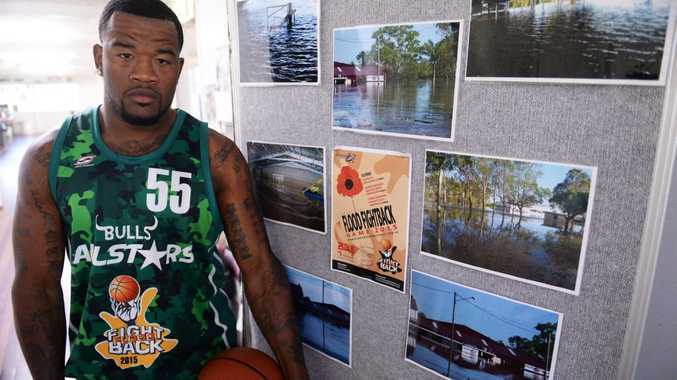 Bulls player Willie Shackleford, who has played in the previous Flood Fightback games, said he was excited about the night, especially with Anzac Day commemorations happening across the country. "For me personally, it means a lot," he said. "I go to the RSL regularly and talk to random people and they taught me about Anzac Day and what it means. "When the floods happened, a lot of the recovery help came from the soldiers so it's just great how all this came together for tomorrow night." Shackleford played in the first Flood Fightback game against recently retired players, which finished as a draw, but last year's 2014 squad thumped its opponents 103-71. "Really the basketball game is not important - it's a tool to give people some entertainment and fundraise for a good cause," he said.